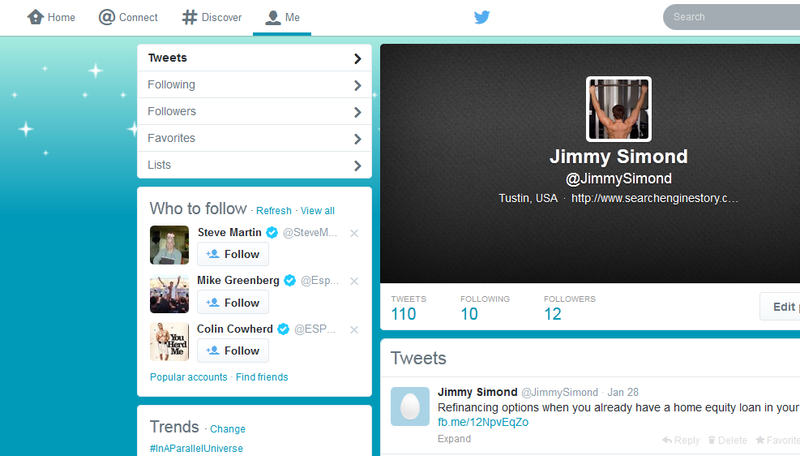 According to recent reports, Twitter has rolled out a new redesigned web version of their service. Twitter had tweeted that they had been planning to roll out a refreshed version of twitter.com that reflects the look and feel of iOS and Android apps, and now they have been successful in doing so. The redesigned version certainly looks cleaner as the tweets appear on a simple white background. The navigation bar at the top of the page has changed to white from black and hence the navigation icons are looking pretty similar to those that appear on Android and iOS. Among the items that have been redesigned are Direct Message icon, the button that helps you view your own profile and the button that you use to write new tweets. The users of this social networking website can also modify the appearance of their profile. The settings menu will give you a list of colors so that you may choose the color of the links that you post and the color of the overlay of the profile. When they majorly changed their designing in 2013, August, the way people viewed conversations on their timeline, they received a backlash. However, the recent redesign is more subtle and involves more on aesthetics rather than functions. The look of twitter won’t be a huge change for some users as Twitter has been testing their new design on about 1% of the people who use this website after studying their habits and making tweaks before finally rolling out the new design to everyone. Apart from aesthetical changes, as mentioned above, the main change is a built-in “compose” box in the left-hand side of the Web page. This new location will smartly eliminate the old pop-up style compose box and appears as a way for Twitter to boost more and more browsers to tweet rather than simply browsing. Twitter has also researched and found out that 40% of their users are simply “lurkers” who only go through other’s posts but don’t share anything on their own. This is why they have made this subtle change so that more and more people get engaged with their contacts, tweet more and follow more people in this social networking website. The users can also see their profile and header photos at the top of the rail on the left of the page. However, the main Twitter page remains unchanged. Although this new design has not appeared to all users and Twitter hasn’t offered a specific timetable for the changes to come into effect. It is certainly not surprising that twitter is making web design more similar to their mobile design as in 2013, they found out that at least 60% of their 200 million users log in through their mobile devices at least once a month. Therefore, making these icons familiar might make it easier for the users to use a web version of Twitter. When people can post and read easily, they start visiting them more often and hence will stay for a longer period of time. Craft the changes carefully and make them work for you at a personal level.